In a concert that immerses the listener in the manifold shades of colour in sound, hear Athens-based composer and viola-da-gambist Nicoleta Chatzopoulou’s subtle and visceral music, followed by an improvisation on the other-worldly sounds of the aquaphone. 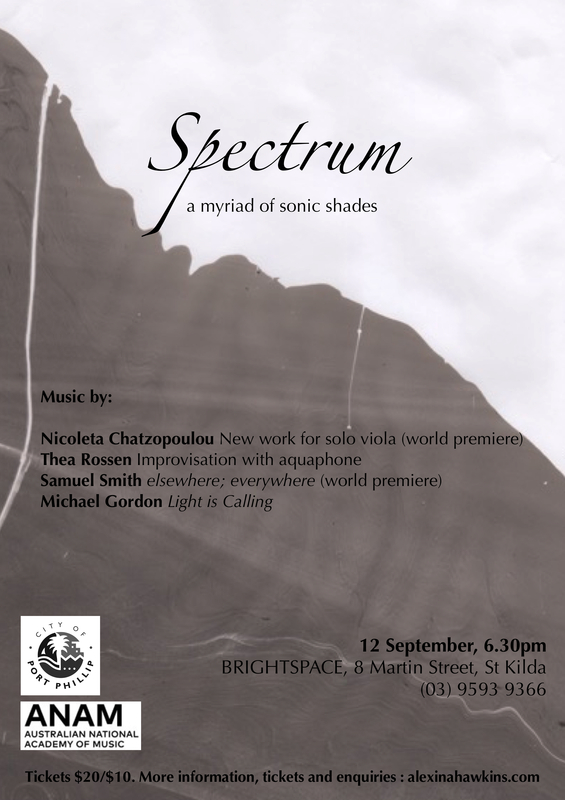 Antiphonal violas present elsewhere; everywhere by Melbourne’s Sam Smith, and to conclude, Michael Gordon’s beautiful Light is Calling “juxtaposes the sound of an acoustic violin* with warped electronic pulses played backwards”. *viola!! Nicoleta Chatzopoulou (1976) is a music composer and viola da gamba player based in Athens Greece. She studied composition, viola da gamba and a course in sonology, at the Royal Conservatory in the Hague and also holds a BSc in Astrophysics from the University of Wales, Cardiff. Currently she is a PhD candidate at the Technical University of Crete in the joint field of Architecture and Music. Her work consists of music for diverse combinations of instruments, chamber ensembles, music theater, 3 chamber operas, vocal and electronic music. Her artistic output as composer, viola da gamba player and performer ranges from early and contemporary music to improvisation, pop and music as part of multidisciplinary projects. She is a collaborator of the Centre for contemporary music research (CCMR) in Athens, teaches music theory and works as orchestrator and composer in theater. Samuel Smith is a Masters candidate at the University of Melbourne under the supervision of Elliott Gyger and currently holds an Australian Postgraduate Award. Originally from Armidale (NSW), Smith studied guitar and composition at the Australian National University under Timothy Kain and Larry Sitsky. His music has been performed around the world, including at the Bang On A Can and You Are Here festivals.